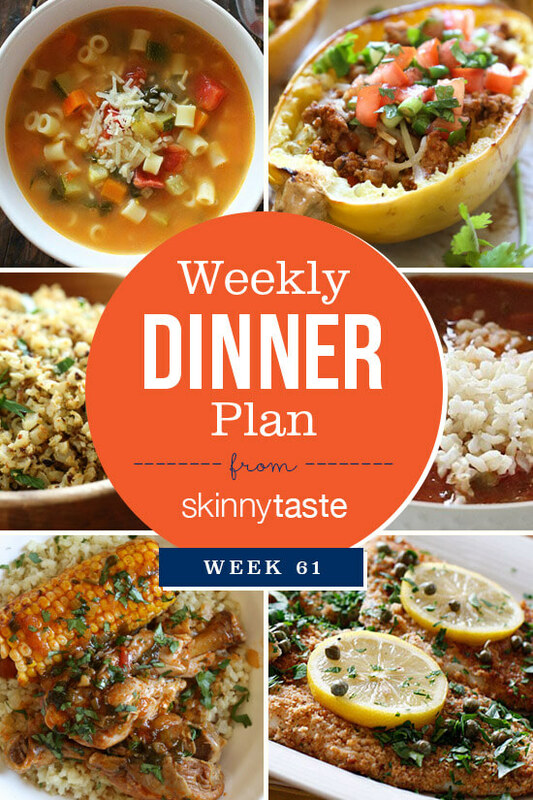 Skinnytaste Dinner Plan (Week 61). This past week I returned to one of my favorite places… Charleston! While there I cooked a few Skinnytaste recipes for a group. One of those recipes was the roasted cauliflower rice that we had with fresh fish we picked up at the local fish market. It was so good, I added it back on the menu this week, hope you enjoy! What is the equivalent to 1 serving? When you make the minestrone soup in the Instant Pot, how long do you cook it for and do you throw the pasta in with everything? Thank you for sharing all your delicious recipes. I just bought your new book. It is great! What are the settings/time you used for the Minestrone soup in the Instant Pot? I just wanted to say thank you…for your incredibly delicious recipes and for your enthusiasm about eating healthy. We have made big changes in our house, and with your books and blog in hand, I am able to keep everyone satisfied while still meeting my own goals. I appreciate your talent and overall approach to food and family so much! Can you tell me what crock pot you recommend? We are a small family of two. I love my 6 quart Hamilton Beach Set It and Forget It. I love seeing your meal plans! My husband and I are doing Whole30 and have made so many of your recipes this month!